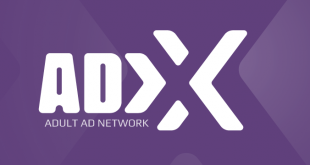 MGID is a leading native advertising platform and a global pioneer allowing advertisers, affiliate marketers, online stores, web marketers and publishers to connect and take advantage of the high-quality content promotions. MGID was started in 2004 and was officially became an ad network in 2008 having office in New York. This is going to be an extensive review on MGID’s advertising part. If you would like to check out our MGID publisher’s review, please follow this link. MGID is a market leader in high quality content promotion in entertainment and lifestyle areas. It is estimated that this native ad network has over 165+ Billion ad recommendations per month. Although it has such huge volume of ad recommendations and traffic, MGID team maintains quality above quantity as they vet each ad before they are approved. Along with the huge ad recommendations, MGID also has over 18,000+ active publishers, 134 categories, 850+ Million unique monthly visitors (as per comScore). Getting registered with MGID advertising platform is pretty much easy and simple. Simply enter your email and agree to their terms and conditions. 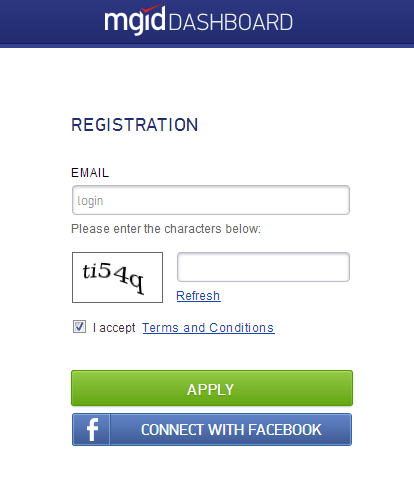 Otherwise you can also use their social login option (Facebook) using which you can sign up with them. As soon as you login, you will be able to see your MGID dashboard. Before you can begin creating your ad campaign, I would request you to add funds first. There is a minimum funds requirement and that is $100 which I believe is necessary even if you want to test your ad campaigns. Simply enter $100 in the box and choose your payment method. You can pay via WebMoney, PayPal and Credit Card. The Transaction button on the right side allows you to track your balance history. MGID traffic which is being sold on a CPC basis is perfect if you are looking for CPA type promotions. 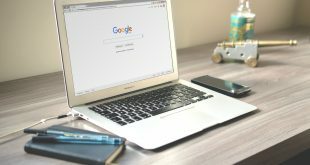 You can jump start creating your first ad campaign which is pretty simple and there is not too much of fuss or big details that you may not understand. Simply click “Add Campaign” button and you will be taken to a new page “Adding new campaign”. In the screen, fill all your campaign Name, your campaign type such as “product promotion” or “content promotion”. You have the variety of options to choose your targeting for ad campaign. 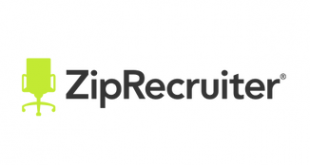 You can select GEO targeting, browser based targeting, Device based targeting and more. 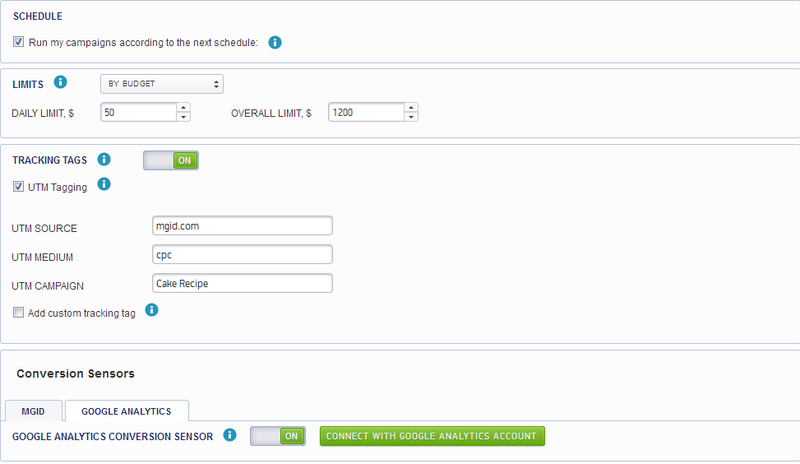 As soon as you click on “Continue” button, below data will be populated where you can schedule your ad campaign. It allows you to track using tags, allows you to set your daily budget, you can set your Google Analytics conversion sensor as well. 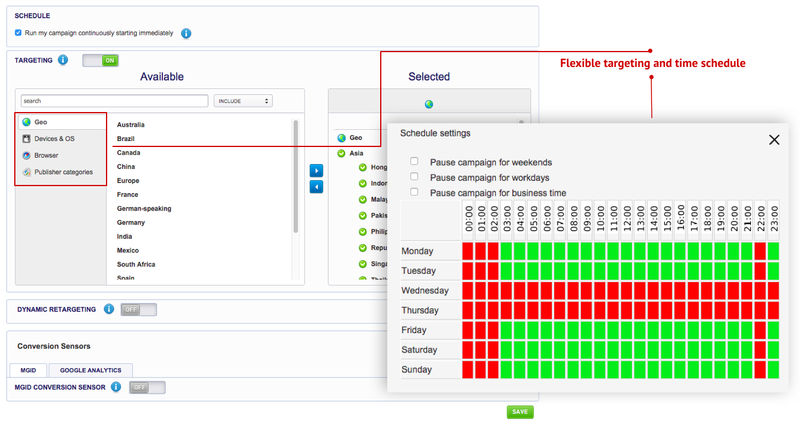 Regardless of having a robust tracking platform, MGID also allows its advertisers to have a flexible targeting and time scheduling option as you can see below. Once you have created your ad campaign and added all your tracking options, you can save your campaign and continue. Now that you have created your ad campaign, it is time to create ad unit. This is what going to be displayed on publisher’s website. I have created a new ad for content promotion as shown below. 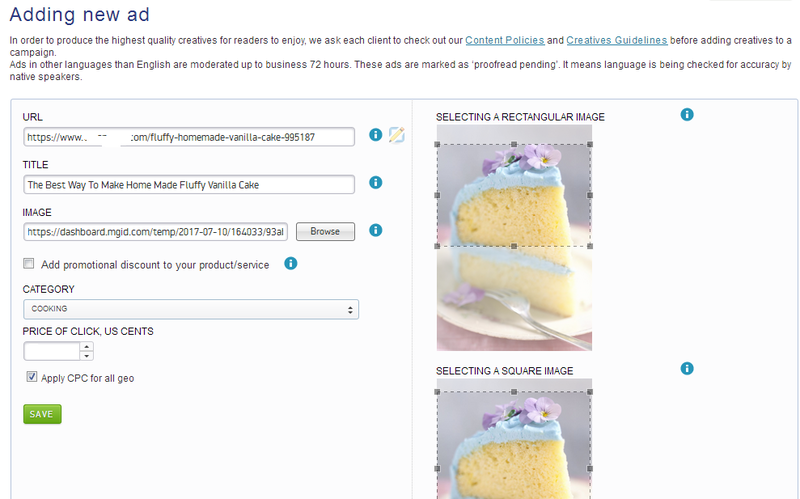 Choose your desired category based on your content that you are going to promote. Price of per click is set based on Cents. This usually is 4.5 to 5 cents which is really good. Make sure your Title is short and catchy. Be creative and add image that attracts the visitor’s attention. The title should make the visitor understand about the product or service as soon as they see it. Inaccurate or deceitful content that misleads people. Content that promotes hate, bigotry, violence or any political, religious. Malware, Trojan horses or other viruses and adware. Once you have created your new ad, you will be taken to the “Ad units” page where you can see your individual ad and basic data per ad. I have taken a screen-grab from an earlier ad campaign for the sake of this review. As you can see in the below picture, the platform allows you to breakdown your daily data. 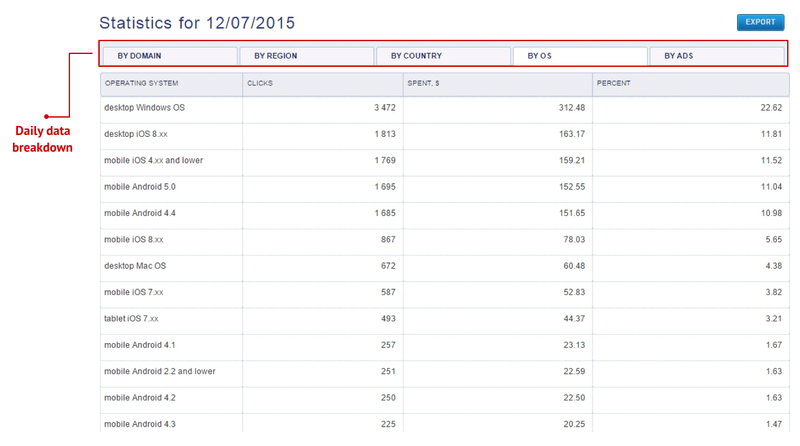 You can breakdown your data by country, region, operating system or simply by individual ads. 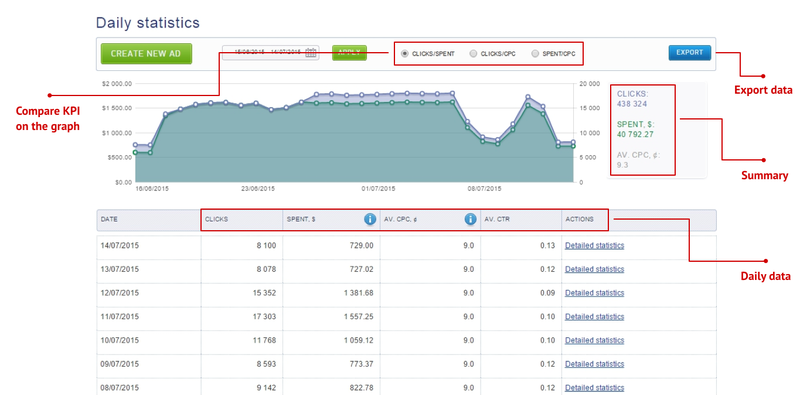 This breakdown of report will help you understand which source of traffic is performing well for your ad. 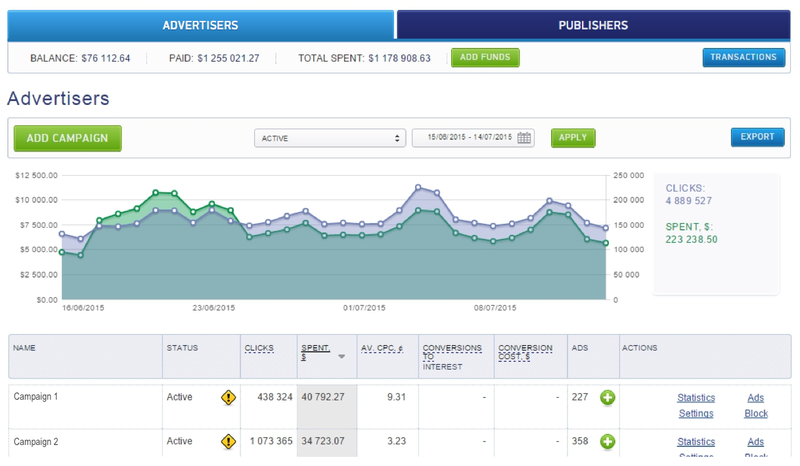 Here is something more about the daily statistics of your ad units. With the extensive reporting system you can compare your KPI, export your data, see your daily summary of data and also you can check the detailed statistics for each date. This is what your actual dashboard will look like. You can track your ad campaigns, number of clicks received, amount of money spent on a campaign, you can track your conversions if you are creating product promotion ad campaign. 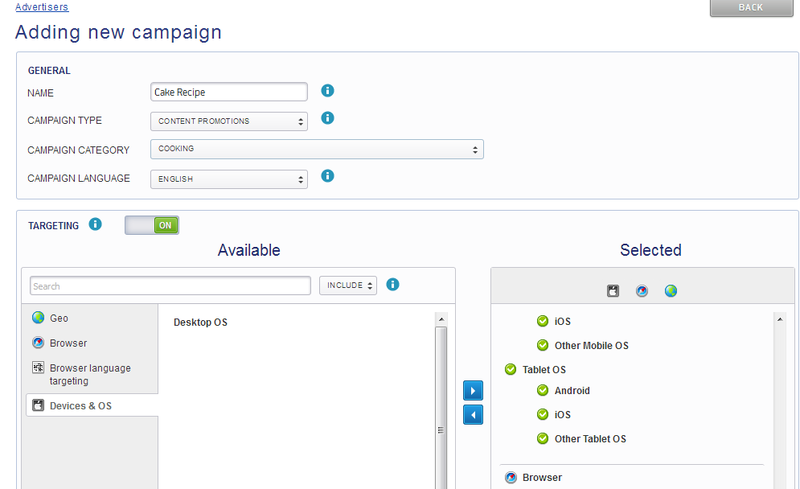 The dashboard gives you direct access to all your campaigns and ad units. MGID provides good support to their customers and you can at any time get support from your dedicated manager who will always be ready to launch your ad campaign without any hassle. MGID support is really good and quick. MGID is one of those native ad networks that helps advertisers to jump start their ad campaign and help them with good ROI. I hope you liked the review of MGID native advertising network. Lots of Targeting options, extensive reporting along with great support makes MGID one of the better native advertising network in the ad industry.